Heading into the live action Walt Disney Studio panel at the D23 Expo last year, I couldn't wait to see the first footage of Captain America: Civil War and hopefully more footage of Star Wars: The Force Awakens. But after the panel, I had been completely blown away by the first footage of The Jungle Book. Jon Favreau was on stage and introduced his new film as one of the most technically advanced films ever made. I'm sure that many of us in the 8,000 seat room laughed at him until he showed us the first footage and told us that everything was filmed in Los Angeles. What we saw was stunning, a fully rendered jungle with pretty much everything created on a computer except for young Neel Sethi who plays Mowgli. It was stunning to see something so lifelike. It was the most talked about footage of the entire panel. Flashforward to April 4th, where I was invited by Dolby to attend the world premiere of the movie at the historic El Capitan Theatre in Hollywood. Up to this point every trailer and TV spot looked brilliant. I had high hopes for this film. When it was time to put on my 3D glasses and the theater dimmed I wondered if my high hopes were too high. The opening minutes made me realize that my expectations weren't high enough. The 3D is stunning, perhaps the best use since Avatar. You feel like you are watching a live action version of Disney's animated Tarzan when he is tree surfing. We are immediately introduced to Mowgli and being part of a wolf pack. Mowgli is raised by Raksha (voiced by Lupita Nyong'o) and Akela (voiced by Giancarlo Esposito). 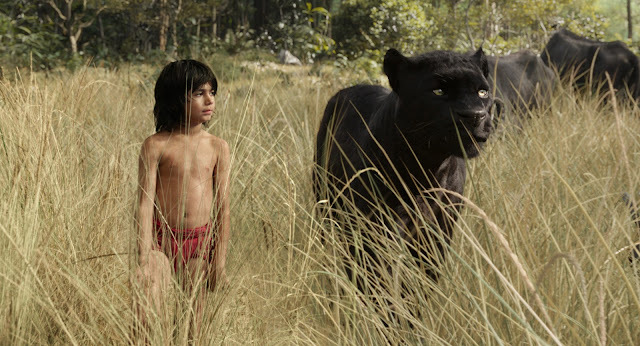 Bagheera (voiced by Sir Ben Kingsley), a panther who found Mowgli, is there to help raise the man cub as well. The relationship between this man cub and the other animals of the jungle is fairly harmonious with the exception of the tiger Shere Khan (voiced by Idris Elba). Khan doesn't like humans since his face was badly burnt by one. He wants the wolves to turn over the man cub to him. Khan is also one of the best villains of the year. He is simply terrifying. Perhaps a bit too terrifying for little ones. There is a scene where even I was stunned by. 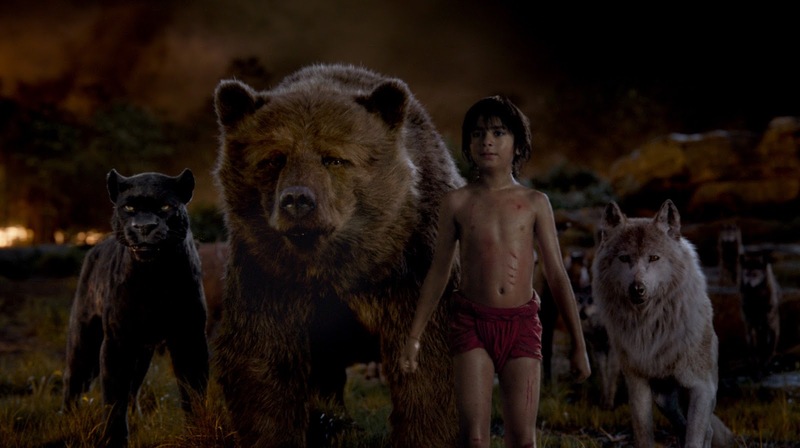 Mowgli decides to leave in hopes that no harm comes to the pack. Bagheera offers to take him back to the man village. After an attack by Shere Khan, Mowgli gets separated from Baheera and ends up meeting snake name Kaa (voiced by Scarlett Johansson) and a bear named Baloo (voiced by Bill Murray). Kaa adds another level of intensity to the film. Baloo adds a wonderful amount of sincerity, warmth and charm here. Plus, there is a fun rendition of, "The Bare Necessities." 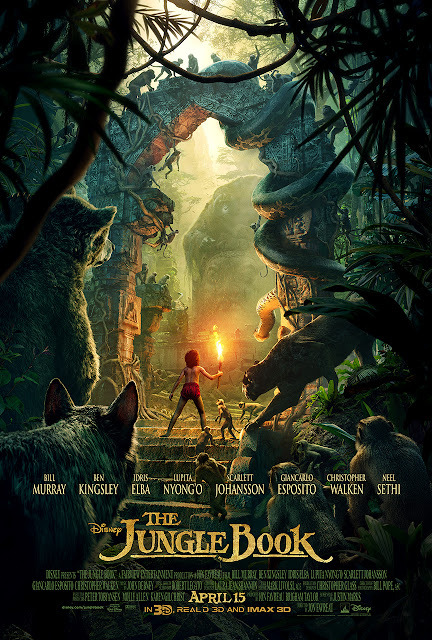 While Mowgli is hanging out with Baloo, the massive King Louie (voiced by Christopher Walken) sets his sights on the man cub and his search for man's red flower, the animals term for fire. Louie just about steals the show and there is a classic tribute to one of Christopher Walkens classic SNL moments. And yes, you get to hear a rendition of the classic, "I Wan'na Be Like You." 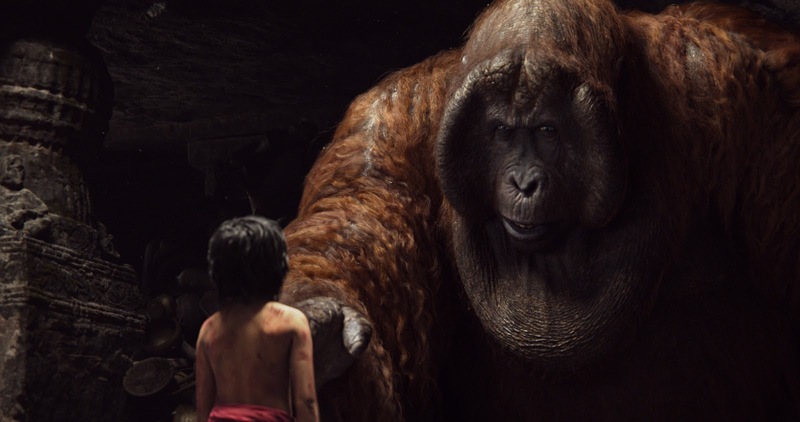 Mowgli escapes King Louie's clutches and heads back to take on Shere Khan. The finale is an epic battle. The film is filled with heart, humor and action. Some of the action may be too intense for younger viewers. The visual effects are astounding. The animals move with a strong physical sense of being. The animals and the environments seem real and the animals interact with Mowgli in a very natural way. The voice actors all add an amazing sense of depth to their characters. Yes, these computer generated animals feel real, with real hearts and real souls. I honestly believe kids will go to zoo's and believe that the animals looking back at them will speak to them. The end credits make brilliant use of the classic fairytale book ending and you will also hear a great rendition of Scarlett Johansson singing, "Trust In Me." Plus, there is one more fun thing to pay attention. Just take a look to see where this movie was filmed on location at! I cannot wait to see The Jungle Book again! 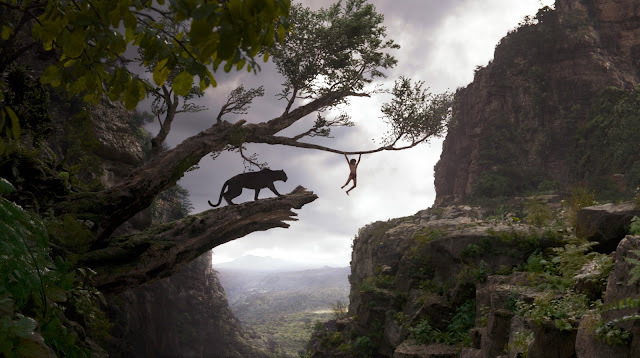 The Jungle Book opens in theaters April 15th!